A recent piece in TechCrunch quoted me as saying that “almost 70 percent of marketers are either unhappy or only marginally happy with their marketing automation software.” The author included a link to the source of that quote, but unfortunately it was broken (it has since been fixed). This lead to enough questions about the data that it now seems worth a blog post on the topic. To resolve the original mystery: the quote references a survey I conducted with VentureBeat and released in June 2014. You can buy it here if you’re interested. Answers came from 159 marketing automation users. 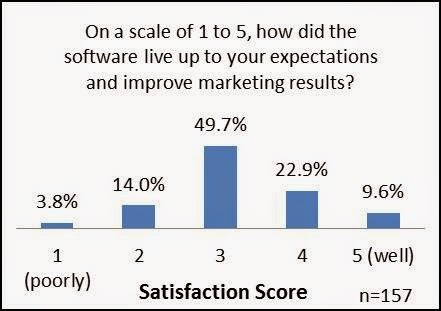 The quote refers to a question about how well marketing automation software met satisfaction and improved results, on a 1 to 5 scale. About 18% gave a score of 1 or 2, 50% gave a 3, and 32% gave a 4 or 5. The 1 and 2 scores are clearly unhappy and I’d consider a 3 to show neutral or marginally satisfied. Hence the “almost 70 percent” quote. 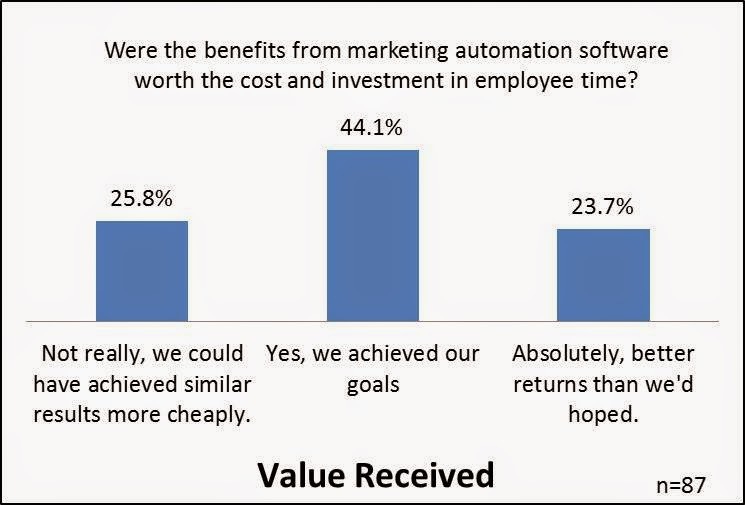 For what it’s worth, the survey also asked a second, more pointed question about whether marketing automation benefits were worth the investment. We received fewer responses (only 87) but the distribution was similar. In fact, the dissatisfied group was a higher percentage: 25.8% and there’s no question how they felt: “we could have achieved similar results more cheaply”. The middle group, 44.1% “achieved our goals” which still sounds to me like marginal satisfaction. Only 23.7% felt they exceeded expectations. I've never considered these results particularly remarkable because they are consistent with other surveys on the topic. See my posts for October 13, 2013 and October 22, 2013 for a several other surveys. Of course, that's all old data and you may wonder whether anything has changed. The short answer is no. 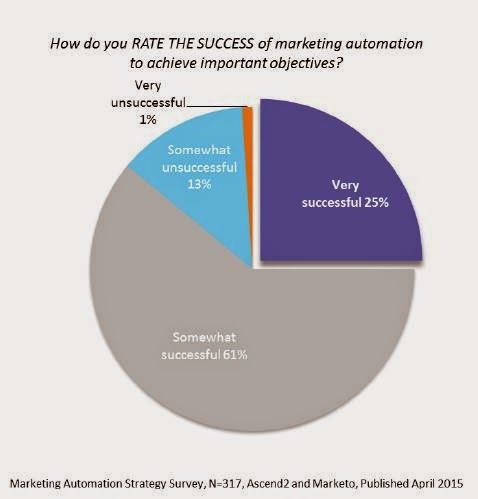 For example, a recent survey from Marketo and Ascend2 found that 14% of buyers rated marketing automation as clearly unsuccessful and only 25% rated it as very successful: again, there was a big intermediate group of 61% who said is was only “somewhat successful”. Another survey, this one from Salesforce.com, is generally more optimistic, showing 37% of users rating marketing automation as very effective or effective. But it also shows a relatively high 31% rating it as not very effective or not at all effective. The real difference is an unusually small middle group, 29% rating marketing automation as “somewhat effective”. What’s probably more disconcerting about this survey is that it shows that marketing automation has relatively low satisfaction and importance compared with other technologies. This suggests that marketers who must prioritize their spending will make other investments first. I must say that I don’t find this topic particularly engaging at the moment. The point of the original TechCrunch article was the growth of open, predictive-based platforms that unify sales and marketing, a direction I agree the industry will take. B2B marketing automation in its current form of systems that primarily use email, landing pages, and visitor tracking to nurture leads before sending them to CRM is a subset of this much larger vision. The challenges of using current marketing automation systems are well known but they will simply make it easier for newer, more effective approaches to replace them. It’s more important and more interesting to focus on that future. One of the little patterns that caught my attention at last week’s Marketo conference was that several vendors mentioned using data from the same source: Madison Logic Data, which recently renamed itself Bombora*. The company was already familiar to me through clients who deal with it. But I had never gotten a clear picture of exactly what they do. Those additional mentions finally pushed me to explore further. A couple of emails later and I was on the phone with Erik Matlick, Madison Logic founder and Bombora CEO. We went through a bit of the back story: Madison Logic was founded as a B2B media company six years ago. It built a network of B2B publishers to sell ads and gather data about their site visitors. Both businesses grew nicely, but the company found that selling media conflicted with finding partners to gather data. So last November it spun off the data piece as Madison Logic Data, keeping Madison Logic as the media business. The change from Madison Logic Data to Bombora was announced on April 13. To which you probably say, who cares? Fair enough. What really matters is what Bombora does today and, more pointedly, what it can do for you. Turns out, that’s quite a bit. Bombora’s core business is assembling data about B2B companies and individuals. It does this through a network of publishers who put a Bombora pixel on their Web pages. This lets Bombora track activities including article and video viewing, white paper downloads, Webinar attendance, on-site search, and participation in online communities. The company tags its publishers' content with a 2,300-topic taxonomy, allowing it to associate visitors with intent based on the topics they consume. It identifies visitors based on IP address, domain, and registration forms on the publisher sites. It also attaches demographic information based on information they provide on the registration forms and the publishers have in their own profiles. The volumes are huge: 4 billion transactions per month, more than 250 million business decision makers, and 85 million email addresses collected in a year. All that information has many uses: [feel free to insert your favorite cliché about how data being important]. 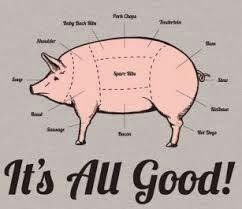 Like meat packers who use every part of the pig but the squeal, Bombora is determined the squeeze the most value possible from the data it assembles. This means selling it intent and demographic audience segments for display advertising, marketing automation and email segmentation, Web audience analytics, data enhancement, content personalization, media purchasing, and predictive modeling. Different users get different data: sometimes cookies, device IDs or email addresses, and sometimes by company, individual, or segment. Publishers who contribute data are treated as part of a co-op and get access to all 2,300 intent topics. Others only can select from around 60 summary categories. 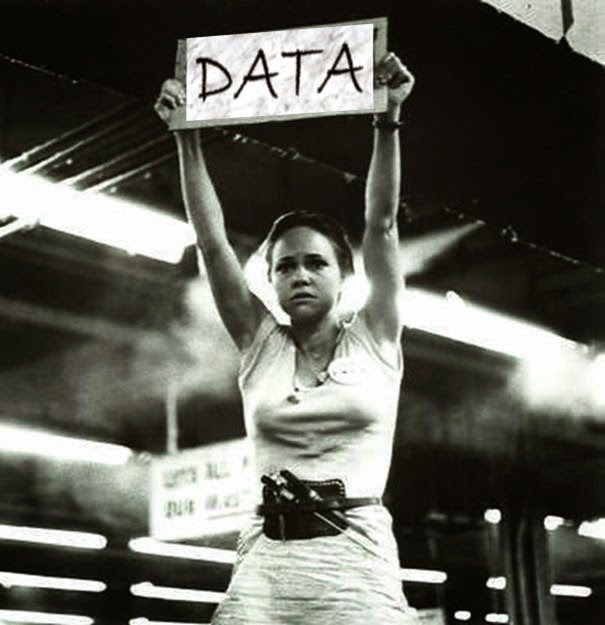 If you’re a B2B marketer, you’re probably drooling at the thought of all that data. So why haven’t you heard of Madison Logic and Bombora before? Well, like those thrifty meat packers, Bombora sells only at wholesale. In each channel, partners embed the Bombora data within their own products. Sometimes it's baked into the price and sometimes you pay extra. It’s a “Bombora inside” strategy and makes perfect sense: everything’s better with data. At the risk of beating a dead pig, I'll also note out that Bombora illustrates a point I've made before: that public sources of data will increasingly supplement and to some degree may even replace privately gathered data. This is a key part of the "madtech" vision that says the data layer of your customer management infrastructure will increasingly reside outside of your company's control. The risk to companies who use this data is that their competitors can access it just as easily, so there's still a need to build proprietary data sources in addition to adding value in other areas such as better analytics or customer experience. Enough of that. I'm hungry. *Something to do with surfing in Australia. There's a sea of data metaphor in there somewhere, I think. Marketo Adds Custom Objects. It's a Big Deal. Trust Me. It's not that I'm obsessed with data. (Well, maybe a little.) But one of Marketo’s biggest technical weaknesses has always been an inflexible data model. Specifically, it hasn’t let users set up custom objects (although they’ve been able to import custom objects from Salesforce.com or Microsoft Dynamics CRM). This was a common limitation among early B2B marketing automation products but many have removed it over the years. Indeed, even $300 per month Ontraport is about to add custom objects (and does a good job of explaining the concept in a typically wry video). Sure enough, when I finally connected with Marketo SVP Products and Engineering Steve Sloan, he revealed that the mobile data is being managed through a new custom objects capability – one that Marketo didn’t announce prominently because they felt Marketing Nation attendees wouldn’t be interested. I suspect that underestimates the technical savvy of Marketo users, but no matter. For people who understand such things, the importance is clear: custom objects open the path to Marketo supporting new channels and interactions, removing a major roadblock to competing as the core decision engine of an enterprise-grade customer management system. This will be more true once Marketo finishes its planned migration of activity data to a combination of Hadoop and HBase. This will give vastly greater scale and flexibility than the current relational database (MySQL). Sloan said that even before this happens, data in the custom objects will be fully available to Marketo rules for list building and campaign flows. The strategic importance of this development to Marketo is high. Marketo is increasingly squeezed between enterprise marketing suites and smaller, cheaper B2B marketing automation specialists. Its limited data structure and scale were primary obstacles to competing in the B2C market, where custom data models have always been standard. Even in B2B, Marketo’s ability to serve the largest enterprises was limited without custom objects. While this one change won’t magically make Marketo a success in those markets, its prospects without the change were bleak. All that being said, the immediate impact of Marketo’s new mobile and ad integration features is modest. The mobile features let Marketo capture actions within a mobile app and push out messages in response. This is pretty standard functionality, although Marketo users will benefit from coordinating the in-app messages with messages in other channels. Similarly, the advertising features make it simpler to export audiences to receive ads in Facebook, LinkedIn, and Google and to find similar audiences in ad platforms Turn, MediaMath, and Rocketfuel. Again, this is pretty standard retargeting and look-alike targeting, with the advantage of tailoring messages to people in different stages in Marketo campaigns. The actual matching of Marketo contacts to the advertising audiences will rely on whatever methods the ad platform has available, not on anything unique to the Marketo integration. In fact, I’d say the audience reaction to the announcement of these features during the Marketing Nation keynote was pretty subdued. (They were probably more excited that they can now manage their email campaigns from their mobile devices.) So maybe next time, Marketo should make the technical announcements during the big speech: at least the martech geeks will be on their chairs cheering, even if everybody else just keeps looking at their email or cat videos or whatever it is they do to amuse themselves during these things. Note: for an excellent in-depth review of what Marketo announced, look at this post from Perkuto. Marketo Conference: Is Predictive Modeling The Future of Marketing Automation? Marketo held its annual Marketing Nation Summit this week, hosting 4,000+ clients and partners. 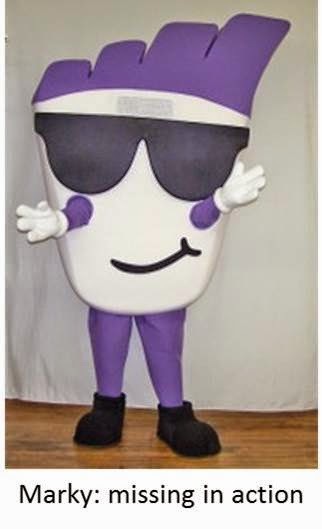 The event seemed relatively subdued for Marketo – I didn’t spot one costumed character – but the over-all atmosphere was positive. The company made two major product announcements, expanding the reach of Marketo campaigns into mobile apps and display ad retargeting. Those struck me as strategically valuable, helping to secure Marketo’s place at the center of its users’ customer management infrastructure. Unfortunately, I wasn’t able to gather enough technical detail to understand how they work. I’ll try to write about them once that happens. As usual for me, I spent much of conference prowling the exhibit hall checking out old and new vendors. Marketo has attracted a respectable array of partners who extend its capabilities. By far the most notable presence was predictive modeling vendors – Leadspace, Mintigo, Lattice Engines, Infer, Fliptop, SalesPredict, 6Sense, Everstring plus maybe some others I’m forgetting. I’ve written about each of these individually in the past, but seeing them in the same place brought home the very crowded nature of this market. It also prompted many interesting discussions with them vendors themselves, who, not surprisingly, are an especially analytical and thoughtful group. Many of those conversations started with the large number of vendors now in the space and how many would ultimately survive. I actually found this concern a bit overwrought – there are other segments, most obviously B2B marketing automation itself, that support many dozens of similar vendors. By that standard, predictive analytics is still far from overcrowded. At the risk of some unfair (and unjustifiably condescending) stereotyping, I’ll propose that part of their concern comes from a sort of Spock-like rationality that says only a few different products are really needed in any given segment. That may indeed be logically correct, but real markets often support more players than anyone needs. I see nothing inherent in the predictive marketing industry that will limit it to a few survivors. In fact, almost immediately after wondering whether there were too many choices, many vendors observed that they were already sorting themselves into specialists serving different customer types or applications. Some products sell mostly to smaller companies, some to companies with many different products, some to customers who want new prospect names, some who want to incorporate external behaviors, and so on. Here, the vendors’ perception is more nuanced than my own; they see differences that I hadn’t noticed. Despite these distinctions, I still expect that most vendors will broaden rather than narrow their scope over time. But maybe that’s my own inner Spock looking for more simplicity than really exists. One factor simplifying buyers' selection decision was that nearly all clients test multiple systems before making a purchase. This contrasts sharply with marketing automation, where many companies still buy the first system they consider and few conduct an extensive pre-purchase trial. The main reason for this anomaly is that modeling systems are highly testable: buyers give each competitor a set of data, let them build a model, and can easily see whose scores do a better job of identifying right people. It also probably helps that people buying predictive systems are generally more sophisticated marketers. There's some danger to relying extensively on test results, since they obscure other factors such as time to build a model and how well models retain their performance over time. I was also a bit puzzled that nearly every vendor reported winning nearly every test. I don't think that's mathematically possible. Probably the most interesting set of discussions revolved around the long-term relation of predictive functions to the rest of the customer management infrastructure. This was sometimes framed as whether predictive modeling will be a "feature" embedded in other systems or a "product" sold on its own. My intuition is it's a feature: marketers simply want to select on model scores the same way they’d select any other customer attribute, so scoring should be baked into whatever marketing system they’re using. But the counter argument starts with the empirical observation that marketing automation vendors haven’t done this, and speculates that maybe there’s a sound reason: not just that they don’t know how or it’s too hard, but that modeling systems need data that is stored outside of marketing automation or should connect with multiple execution systems that marketing automation does not. The data argument makes some sense to me, although I think marketing automation itself should also connect with those external sources. I don’t buy the execution system argument. Marketing automation should select customer treatments for all execution systems; scores should be an input to the marketing automation selections. But there’s a deeper version of this question that asks about the role of predictive analytics within the customer management process itself. Marketo CEO Phil Fernandez touched on this indirectly during his keynote, when he observed that literally mapping the customer journey as an elaborate flow chart is inherently unrealistic, because customers follow many more paths than any manageable chart could contain. He also came back to it with the image of a “self-driving” marketing automation system that, like a self-driving car, would let the user specify a goal and then handle all the details independently. Both examples suggest replacing marketer-created rules to guide customer treatments with predictive systems that select the best action in each situation. As several of the predictive vendors pointed out to me (with what sounded like the voice of painful experience), this requires marketers to give up more control than they may find comfortable – either because machines really can’t do this or because it would put marketers out of a job if the machines could. Personally, I'll bet on the machines in this contest, although with many caveats about how long it will take before humans are fully or even largely replaced. I see no inherent reason that machines couldn’t ultimately do the persona and life stage definition. None of vendors do it today, although several appear to have given it some thought. Automated content creation is already available to a surprising degree and will only get better. But, to get back to my point: the technologies to do these things are very different from predictive modeling. So if new technology is to replace marketing automation as the controller of customer treatments, that technology will include much more than predictive modeling by itself. * Yes, it has occurred to me that a fully machine driven system might not need personas and lifestages, which are aggregations needed because humans can't deal with each person separately. But marketers won't adopt that approach until (a) machines can also create content without the persona / lifestage framework and (b) humans are willing to trust the black box so completely they don't need personas and lifestages to help understand what the machines are up to. On the other hand, you could argue that content recommendation engines like BrightInfo (also at the Marketo show) already work without personas and lifestages...although I think they usually focus on a near-term action like conversion rather than long-term impact like incremental lifetime value. I spent last Tuesday and Wednesday at the MarTech Conference in San Francisco, where close to 1,000 marketing technologists heard sage advice, shared experiences, and otherwise frolicked with their peers. It might just be me, but this MarTech felt a bit less intense – less tribal -- than the first, held last August in Boston. It might have been the larger crowd, more laid back West Coast audience, or that talking to so many exhibitors reduced the time attendees spent interacting with each other. Or maybe the second MarTech experience is inherently less ground-breaking than the first. - Thomas Stubbs of Coca-Cola describing the lessons from several huge Web site launches tied to the World Cup (and therefore with fixed deadlines). What stood out was that the smoothest deployment happened when the creative and technical work was done by two independent agencies. This gave the technical team the leverage to push back against unrealistic timelines. By contrast, when the company used a combined creative-technical agency, the technical team’s objections were often overruled by agency management. - Several presenters diagrammed the actual marketing systems in place at their companies. This was an important reminder of how complicated marketing technology infrastructures are in the real-world, as opposed to the simple diagrams drawn by people like me. - A panel with Oracle, Salesforce.com and Marketo, where incisive questions from Chief Martech Himself Scott Brinker highlighted the different philosophies underlying each vendor’s marketing cloud and how few companies really deploy any cloud in full. - A panel of venture capitalists where at least one member argued that marketing technology is the one sector where best of breed systems can outcompete integrated suites, because the small performance advantage of best of breed systems translates into large financial value. I’d say the only place that is clearly true is among large enterprises, which have the skills to take advantage of the most sophisticated features and where small percentage benefits translate to large dollar amounts. If you want a (pseudo) equation: integration for best of breed costs pretty much the same regardless of company size, while the benefits increase with company size. So there’s a point beneath which the costs outweigh the benefit. The real question is whether SaaS technologies will reduce integration costs or make them volume-related. If that happens – and the jury is very much out – then best of breed would make sense for many more companies, especially if best of breed vendors can build in enough automation that high user skills are also not required to benefit from their systems. - Acrolinx: very sophisticated scoring of content to match its tone, complexity, subject, and other attributes to target audiences. It doesn’t write copy but does analyze the copy you give it. - Advanse: rule-based ad customization drawing on an advertiser’s individual-level data as matched to audience cookies. The system won’t create new ads by itself but will test alternatives designed by the user and will automatically deploy the winner. - brandAnalyzer by Global Science Research: uses a large, projectable consumer survey and social media traffic to build detailed psychological profiles of brand customers. These are used to help guide creative development and media placements, but not to target individual consumers. - Amplero by Globys: self-directed machine-learning to find the best message for each customer for each situation. Definitely very cool but we spoke twice and I still don’t understand exactly what it’s doing. I know the system generates messages with random combinations of offers, incentives, and prices and then refines its choices over time based on which perform best in which situations. But that leaves a lot of questions unanswered. I’ll get a briefing and let you know what I find. - Insightpool: identifies social media influencers and manages campaigns to build relationships with them. What’s interesting is that the system looks for different types of influencers and designs different campaigns based on different user goals (traffic, followers, reviews, etc.) Campaigns contain different types of social media interactions (mentions, follows, direct messages, etc.) at different intervals or sequences. - Unmetric: social intelligence for brands. This is social media monitoring on steroids, ranking performance of individual content items, classified by topic and brand, and then offering a variety of reports and alerts. It also tracks response time to social media customer service requests. - Whatrunswhere: tracks ad placements in online media to give competitive intelligence. World-wide coverage with details about reach and frequency. Of course, there were many other interesting exhibitors; apologies to those I've left out. The full list is available here on the MarTech Conference site.